Provide comfort for the family of John McElrath with a meaningful gesture of sympathy. 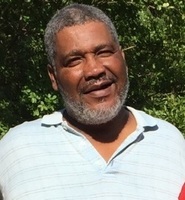 Mr. John Edward “Yoda” McElrath, 61, of Greenville, South Carolina, passed on Thursday, March 7, 2019, at Prisma Health Upstate. He was a son of the late Eugene and Odessa Gamble McElrath. John attended Berea High School and worked at Global Sales Group, Inc. He was preceded in death by his parents; a sister, Odessa Vivian McElrath; and a brother, Eugene McElrath, Jr.
Left to cherish many fond and loving memories are four sisters, Mary Lucille (Melvin) Watts of Los Angeles, CA, Carol Yvonne McElrath, Beverly McElrath and Sheila (Steve) Bowens, all of Greenville, SC; one brother, Kevin (Delores) Crite of Greenville, SC; a sister-in-law, Willett McElrath of Greenville; two devoted nephews, Rodrick McElrath and Eric McElrath, both of Greenville; an aunt, Eunice Gambrell of Pittsburgh, PA; six uncles, George McElrath of Taylors, John (Della) Gamble of Maryland, LeRoy Gambrell of Modesto, CA, R.C. (Margaret) Gamble of Fairfax, VA, Maxie (San) Gamble of Greenville, and Julius (Darice) Gamble of Fayetteville, GA; and a host of other relatives and friends.